Types of Art: Dan sculptors mainly produce masks which deal with virtually every element in Dan society, including education, competition, war, peace, social regulation, and of course, entertainment. They also produce stylized wooden spoons and intricate game boards used for mancala, a common game of "count and capture". The Dan Tribe and sub Tribes Guere and Yacouba live in Western Ivory coast (Ivory Coast) and Liberia, (see credit #2). They are people from the rainforest. Their traditional masks and masquerades are some of the best known in Western countries. Dan masquerades are usually performed by male associations for rituals, education, social control and entertainment. Masks were thought to embody the most powerful of spirit forces called gle. Each gle has its own character. These bush spirits and masquerades brought control and order to village life. There are a variety of Dan face masks, each of which has a different function: BUGLE MASKS Masks with round eyes that project outwards are usually Bugle masks, which today are used at planting time to aid in the creation of good crops. They were considered masculine and more aggressive. 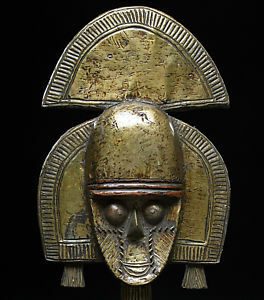 The Bugle mask is characterized by an exaggerated mouth, a dark, thick patina, a row of stylized horns on the forehead and, when preserved, a high feathered coiffure. Historically its wearer dances and makes trouble in order to provoke a reaction from the people watching. It was worn in pre-war ceremonies. BAGLE MASKS The Bagle mask has an oval, concave face, a low forehead and typical tubular eyes. It is worn to entertain while the wearer dances, beats the musicians with a curved stick and throws objects he finds in their way. GUNYEGE MASKS Round eyed masks are used in racing games and ceremonies in which the masked spirit must compete against unmasked runners. If the wearer loses the race, it means the spirit has deserted that person and the mask goes to the winner, as a trophy to wear in the next race. Its wearer is pursued by an unmasked runner or runners and, if caught, the unmasked runner wears the mask and is, in turn, pursued. Historically, these races trained men to fight and the winner gained social recognition. Nowadays, the races are more like a game. ZAKPAI GE MASKS Zakpai masks have similar features to the Gunyege, but has a red cloth over its eyes. These masks usually have a horizontal, usually red band across the eyes and are used to enforce fire prevention. The wearer monitors bonfires and punishes those who's bad practices endanger the village. If a fire is not properly contained, the masquerader will often beat the offending person with sticks. DEANGLE MASKS Masks with softly modeled features, slit or downcast eyes which are occasionally covered with white kaolin and often feature a vertical ridge on the forehead are regarded as feminine masks, Deangle, an idealized form of beauty and grace. Worn by the intermediary who acts between the village and the forest initiation camp. They represent gentle spirits who collect food from the villagers for boys away in initiation camps and were used for nurturing, teaching and entertaining. White bands across the eyes copy the practice of Dan females painting white kaolin on their faces for special occasions. TANKAGLE MASKS Feminine masks, often more intricately carved than Deangle masks, are used in singing masquerades and confer blessings on the village. These masks are worn during entertainment celebrations. KAOGLE MASKS The Kaogle mask has triangular cheek-bones and eyes and its wearer is meant to stimulate a festive mood among the audience by throwing sticks at them. DUGLE MASKS The Dugle mask, or 'the cow', has a high forehead and a huge mouth resembling a beak and is worn for entertainment purposes. GAGON MASKS The Gagon mask has the same function as the Dugle and is predominantly found in the northern Dan territory. It has a high-domed forehead, slit eyes, a long, beak-like nose often with black monkey fur attached underneath, and a long, occasinally mobile jaw. Originally an educational mask instructing people on the importance of the hornbill, now these masquerades are used mostly for entertainment. GLEWA MASKS The Glewa mask is worn for peace-making purposes. It is a large mask, either in the shape of a stylized elephant with tubular eyes and a domed forehead with a medium ridge, or in the form of a human face with exaggerated features. MINI PASSPORT MASKS The Dan people also carried and used small masks (less than 8 inches tall) which are sometimes called 'passport' masks. They were often sewn onto a piece of cloth and kept wrapped in a leather pouch and possibly worn in the small of the back. They are miniature copies of a family mask and sometimes received libations and filled with sacrificial or magic substances. These talismanic apotropaic (intended to ward off evil) masks also act as witnesses during initiation ceremonies. True examples are quite rare and expensive. Contemporary ones are carved. GO GE MASKS The Go Ge mask belongs to the Go secret society and is worn to announce the death of important chiefs. Its features vary from one village to another, but the masks are usually large, and have an elaborated plaited coiffure. GUERE MASKS The Guere, neighbors and considered a subclan of the Dan, make masks for similar purposes but usually of a form that is more ugly or scary than Dan masks. They are used for rituals, education and social control. History: Oral traditions describe the Dan society of the 19th century as lacking any central governing power. Social cohesion was fostered by a shared language and a preference for intermarriage. Generally, each village had a headman who had earned his position of advantage in the community through hard work in the fields and through luck as a hunter. They usually surrounded themselves with young warriors for protection from invading neighbors and exchanged gifts with other chiefs in order to heighten their own prestige. Out of this custom was born the basic tradition of tin among the Dan, which was based on displaying one's success in order to build a good reputation and name. Economy: The tradition of tin is still an essential part of the Dan economy today. Young people strive to make a name for themselves by lavishly spending at community feasts to demonstrate their wealth. Although farming and hunting have been largely replaced by laboring in the diamond camps or working at the rubber plantations, the establishment of a hierarchical social order is still based on the individual's ability to succeed. Political Systems: It has been only recently, through the creation of the leopard society (go), that a unifying political organization has emerged among the Dan. The secret political society centers around the powerful spirit go, who is responsible for peacemaking. Although the power of go seems to be increasing throughout Dan society, individual villages still maintain a high degree of political independence, and the economic power of the individual is still highly valued. Religion: The Dan world view holds that everything can be divided into two separate and clear categories. The primary dichotomy is between village and bush, in other words, things that have been controlled by man and things that have not. Crossing over the dividing line is dangerous business, and whenever it is done, whether to clear new fields or simply crossing the forest, the bush spirits must be appeased. In order to take part in village life, the bush spirits must take corporeal form. The Dan believe that all creatures have a spirit soul (du), which is imparted onto humans and animals from the creator god, Xra, through birth. One's du is immortal and is passed on after death to a new being. However, some du remain bodiless. They inhabit the forests as bush spirits and must establish a relationship with a person if they wish to be manifested and honored. Often the spirit will request the chosen person to dance the spirit, utilizing a mask to illustrate the spirit's embodiment.